Aflac Incorporated (AFL), through its subsidiary, American Family Life Assurance Company of Columbus, provides supplemental health and life insurance. The company is a member of the dividend aristocrats’ index, has paid dividends since 1973 and increased them for 36 years in a row. The company’s last dividend increase was in February 2018 when the Board of Directors approved a 15.60% increase in the company’s quarterly dividend to 26 cents/share. The company’s stock recently split 2:1 as well. The company’s largest competitors include Nippon Life Insurance Company, Asahi Mutual Life Insurance Company and American fidelity Assurance Company. 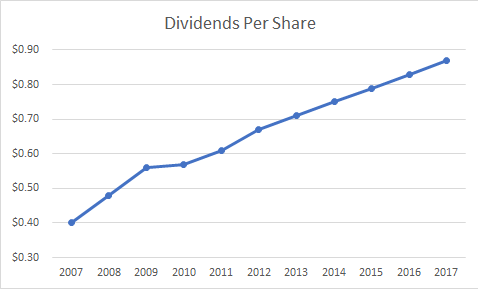 Over the past decade this dividend growth stock has delivered an annualized total return of 5.40% to its shareholders. The company has managed generate an impressive growth in earnings per share over the past decade. Earnings per share have risen by 7.70% per year. Analysts expect Aflac to earn $3.69 per share in 2018 and $3.87 per share in 2019. In comparison Aflac earned $3.46/share in 2017. The company has consistently repurchased stock over the past decade, reducing its share count from 958 million shares in 2008 to 798 million in 2017. The thing that is most interesting about Aflac is that although it is a US based company, it generates the majority of revenues from Japan. The company generates 70% of sales from Japan, with the remainder coming from US operations. Aflac is offering its products in almost 90% of Banks in Japan, and more branches are expected to start pushing the products in the coming years. Aflac steadily increases the number of sales agents in Japan to push its products. Most of its policies offer coverage for illnesses not insured through Japan’s health care system, such as cancer. Basically, the company sells supplemental life insurance and cancer insurance policies through approximately 120,000 agents. The company targets employers, and has managed to add its supplemental insurance policies as part of the overall benefits packages that employers offer to their workers. This keeps costs relatively low, and provides a very good scale and the ability to generate recurring revenues. The scale is because 90% of employers in Japan offer the Aflac insurance and because Aflac is selling to employers, rather than target individual employees – hence the salesforce gets most bang for their efforts. The recurring revenues are generated from the payroll deductions from the employees who signed up through their employer plans. The company is also able to find new ways to sell more insurance, through creating new products or finding new channels. It started selling insurance through the bank channels in 2007, and this has been a big success. Aflac would also be a beneficiary of any technological improvements, as this could further decrease administrative costs for example. Of course, the risk to Aflac is the fact that it earns revenues in Japan, where a large portion of population is aging and the country has a high debt levels, coupled with very low interest rates. Approximately 40% of Aflac’s investments are in Japanese bonds. This leaves the company somewhat less exposed to depreciation of the Japanese currency, although it still could have an adverse impact in the short-term. Longer term, I view the effect of currency fluctuations on net incomes as a wash, since currencies of developed countries are not debased significantly relative to the US dollar. That being said, the company is still growing operations in Japan. Its competitive strengths include being a low cost producer, and its distributions network of selling policies though brokers, banks and the Japan Post Office. As the Japanese population continues aging, the demand for supplemental insurance coverage is expected to grow. The real growth kick could be in the US, where a small portion of US businesses offer Aflac's policies. The fact that Aflac has built a strong brand in the US, based off the white duck, is another strong differentiator. Currently, it is providing insurance that offers protection against income and asset loss. For Aflac, voluntary insurance sold at the worksite represents virtually all of its focus, whereas its competitors tend to offer voluntary products as a peripheral line of business. The company has also started in 2009 to target larger businesses, by offering Group Plans to the employees of those businesses. Insurers like Aflac typically do not earn much from the spread between collecting premiums and paying out benefits. Most of their profits are derived from holding the so called “float”, which is the premiums received before payouts, and invest it in fixed income securities. As any serious investor worth their salt knows, interest rates have been a little low, to say the least. However, if interest rates were to increase over the next five years for example, this float is going to generate much higher earnings for companies like Aflac. Therefore, insurance companies are a play on rising interest rates over time. 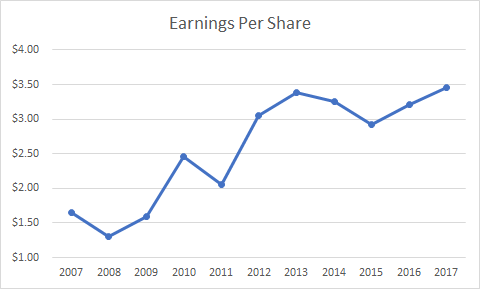 The annual dividend payment has increased by 8.10% per year over the past decade, which is slightly higher than the growth in EPS. This was possible due to the expansion in dividend payout ratio. However, the rate of increase has slowed down dramatically over the past five years. An 8% growth in distributions translates into the dividend payment doubling almost every nine years on average. If we look at historical data, going as far back as 1984 we see that Aflac has actually managed to double its dividend every six years on average. 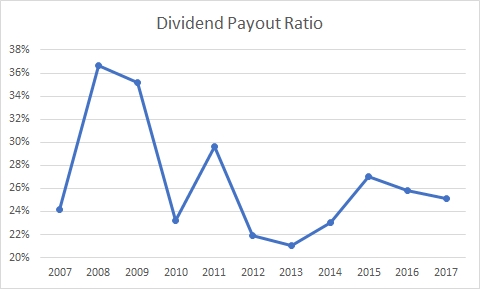 The dividend payout ratio has increased slightly from 24% in 2007 to 25% in 2017. A lower payout is always a plus, since it leaves room for consistent dividend growth minimizing the impact of short-term fluctuations in earnings. Currently, Aflac is attractively valued at 11.30 times forward earnings, has an adequately covered dividend and yields 2.40%. I would consider adding to my position in the stock subject to availability of funds. Are you ready for the next bear market?